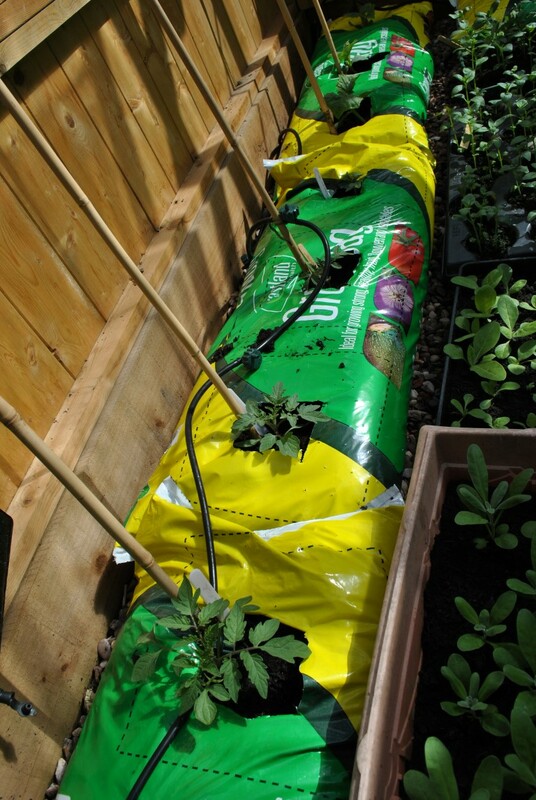 Not having a greenhouse at present, I’m growing my tomatoes in a sunny spot, in growbags outside. 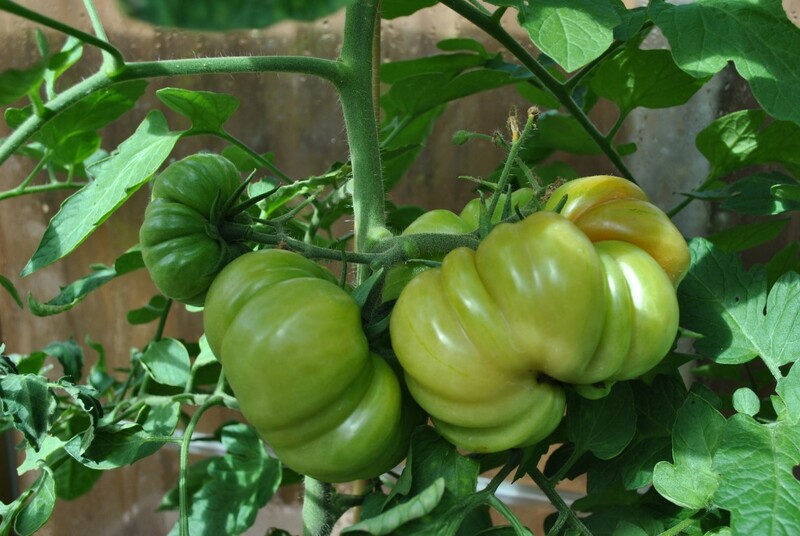 There are three varieties – Tigerella which should be stripy (clue’s in the name), cherry tomatoes for salads, and the one I’m most interested to see the results of – sons of Beefy. Well, OK, that’s not the Latin name, but these plants were grown from the seeds I saved from my biggest, beefiest beef tomato last year. I’m hoping for some whoppers! So far, so good. They are all appear healthy and strong and I’ve already spotted my first tomato hanging provocatively from one of the branches. I’ve been diligently nipping out the bits that grow in the ‘V’ between the stem and the leaves, so the plants funnel all their energy into producing fruits and the air circulates more freely around them. It’ll soon be time to begin their feeding regime too. Exciting stuff. If you haven’t come across these yet, they’re a relatively new type of plant where you get potatoes from the soil and tomatoes from the foiliage – all from the SAME plant. Although I haven’t tried them for myself, it’s my opinion that you can muck about with stuff a little too much in the name of scientific research. The involuntary frown and curl of my lip must have given my thoughts away. “Think about it. You’re merrily watering your Tom Tato plant. What’s to stop all the spuds greedily sucking out all the goodness in the soil and leaving none left to travel up to the tomatoey bit? 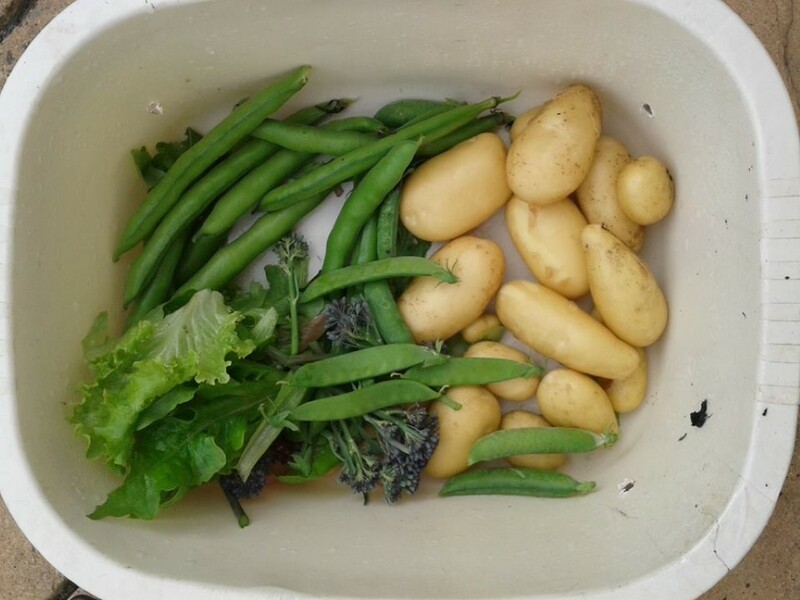 You could end up with mahoosive potatoes and spindly little tomatoes. How does it get the balance right?” I concluded with, “To get any sort of decent harvest from both ends, I’d imagine you’d have to feed the neck out of the damn things”. As the world went slightly hysterical over the coming of the new royal baby, I was having a smug little moment to myself down on the patch with my own little arrivals. 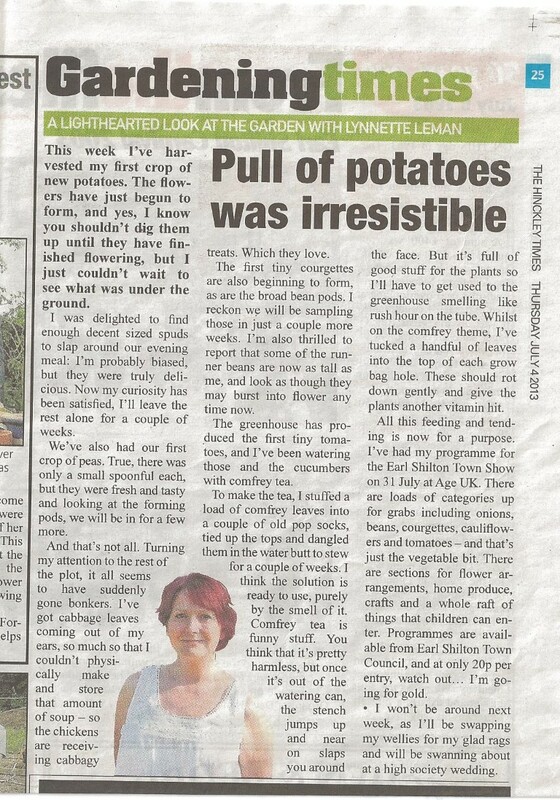 Well, I am delighted to be able to tell you that not only have these grown almost to the top of the arches, but I have beans dangling in abundance all over them. When the plants do reach the top, I’ll pinch out the tips to encourage sturdier growth further down. I have three varieties in all – White Lady, Pantheon and a rather startling little number called Selma Zebra. This was an impulse buy heritage variety, and I’m so glad I tried her. The flowers are a gorgeous pink colourand the beans are mottled with purple. I’m pretty certain these will not be ‘available in a store near you’ any time soon, and I will definitely be leaving a few on the plant to dry for next year’s seeds. As two of the Pantheons are almost a foot long already, I’ve tied a bit of string around their stalks. 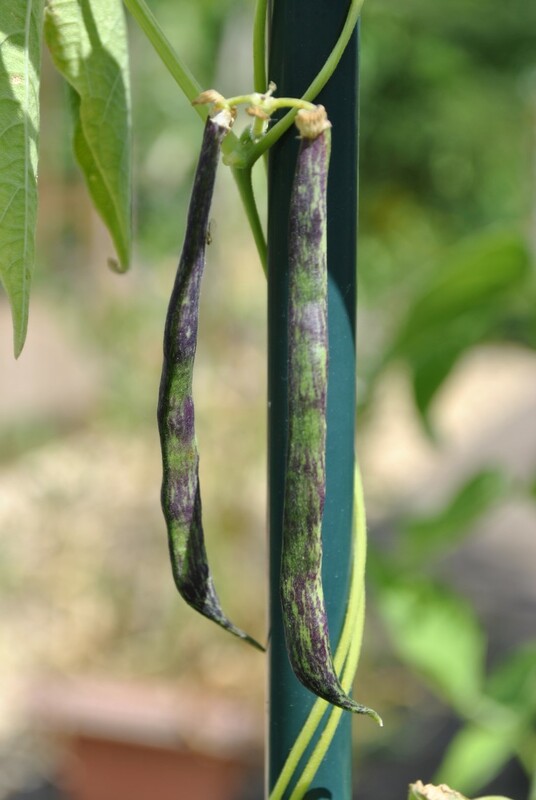 This signifies that these beans are definitely not for picking: I’ve earmarked them for the ‘Longest runner bean’ category in the Earl Shilton Town Show at the end of the month. With a good couple more weeks of growing time I think they are in with a fighting chance. Elsewhere in the garden, the greenhouse is flourishingand we’ve harvested the first couple of cucumbers already – which were sweet and delicious. The tomatoes aren’t yet ripening, but I’m sure it’s only a matter of time. 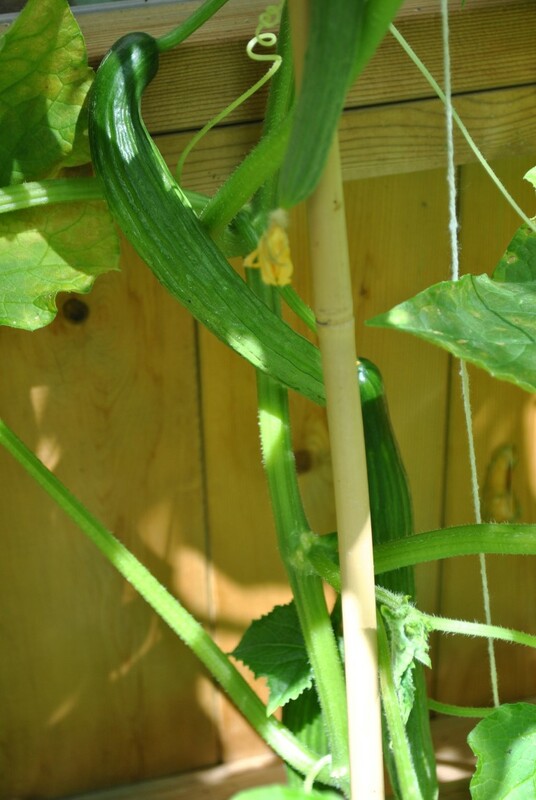 I read in the week that a sprinkling of crushed egg shells around the base of tomatoes and cucumbers can give the plants a good boost of calcium. This apparently can help them reach their full flavour potential and also helps the plants regulate their water intake, preventing conditions like splitting and blossom end rot. As egg shells aren’t something that are in short supply around our house, I decided to give this method a whirl, and whizzed out to put a generous handful of shells around each plant. This, together with regular feeds should make for a bumper crop. The tomatoes I planted in the upside down planters are also doing remarkably well. I have to admit I was dubious about these at the start – it’s just not natural for plants to grow upside down – but they appear to be proving me wrong. 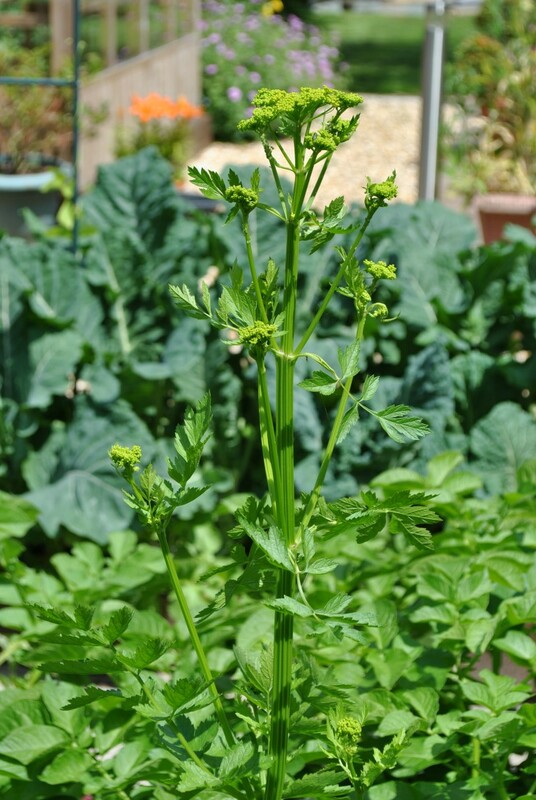 The plants are healthy and strong, and a good number of cherry tomatoes have started to form on the branches. Very soon it’ll be tomatoes and cucumbers for everyone! 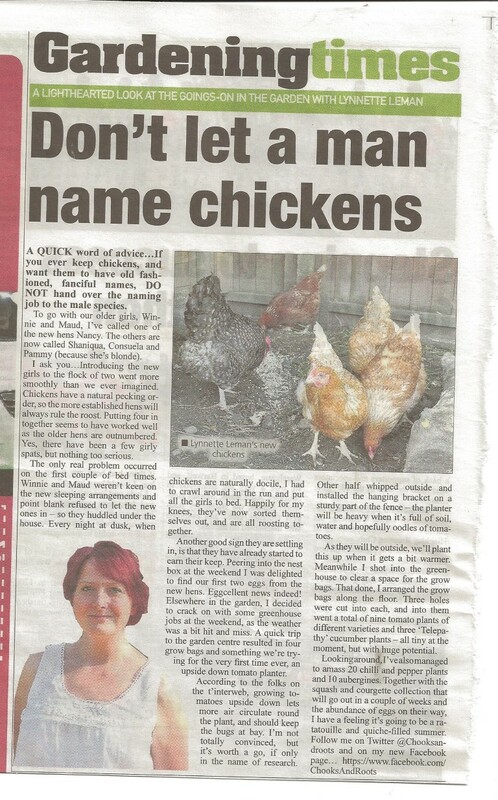 A quick word of advice…If you ever keep chickens, and want them to have old fashioned, fanciful names, DO NOT hand over the naming job to the male species. To go with our older girls, Winnie and Maud, I’ve called one of the new hens Nancy. Introducing the new girls to the flock of two went more smoothly than we ever imagined. 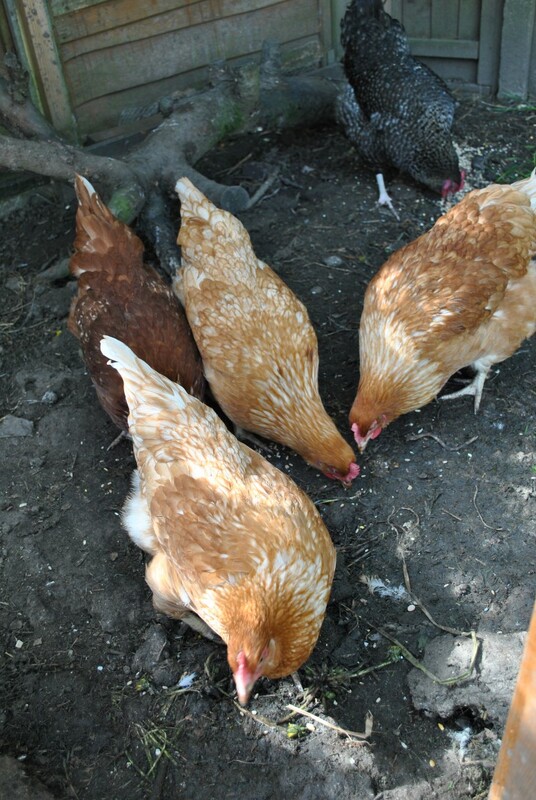 Chickens have a natural pecking order, so the more established hens will always rule the roost. Putting four in together seems to have worked well as the older hens are outnumbered. Yes, there have been a few girly spats, but nothing too serious. The only real problem occurred on the first couple of bed times. Winnie and Maud weren’t keen on the new sleeping arrangements and point blank refused to let the new ones in – so they huddled under the house. Every night at dusk, when chickens are naturally docile, I had to crawl around in the run and put all the girls to bed. Happily for my knees, they’ve now sorted themselves out, and are all roosting together. Another good sign they are settling in, is that they have already started to earn their keep. Peering into the nest box at the weekend I was delighted to find our first two eggs from the new hens. Eggcellent news indeed! Elsewhere in the garden, I decided to crack on with some greenhouse jobs at the weekend, as the weather was a bit hit and miss. A quick trip to the garden centre resulted in four grow bags and something we’re trying for the very first time ever, an upside down tomato planter. 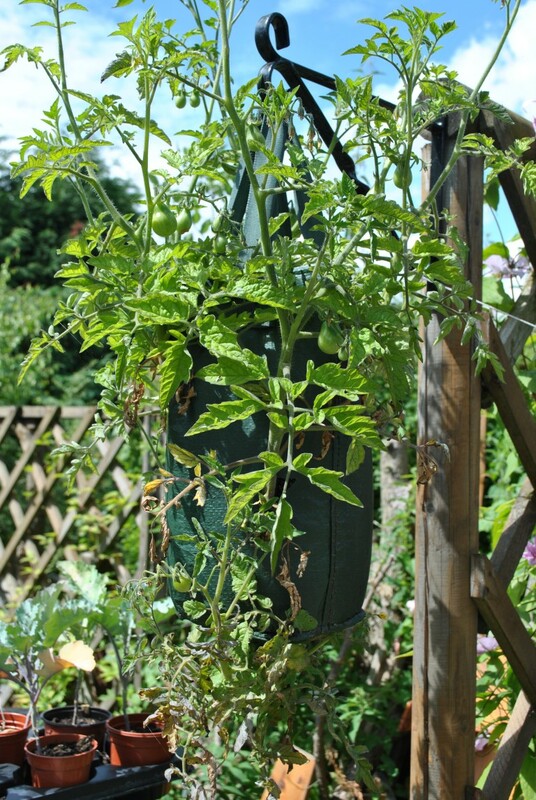 According to the folks on the t’interweb, growing tomatoes upside down lets more air circulate round the plant, and should keep the bugs at bay. I’m not totally convinced, but it’s worth a go, if only in the name of research. les of tomatoes. 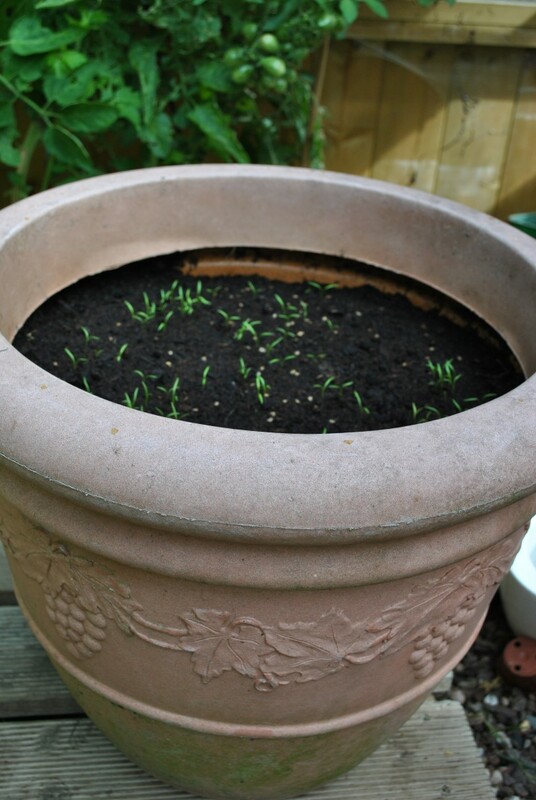 As they will be outside, we’ll plant this up when it gets a bit warmer. Meanwhile I shot into the greenhouse to clear a space for the grow bags. That done, I arranged the grow bags along the floor. Three holes were cut into each, and into them went a total of nine tomato plants of different varieties and three ‘Telepathy’ cucumber plants – all tiny at the moment, but with huge potential. 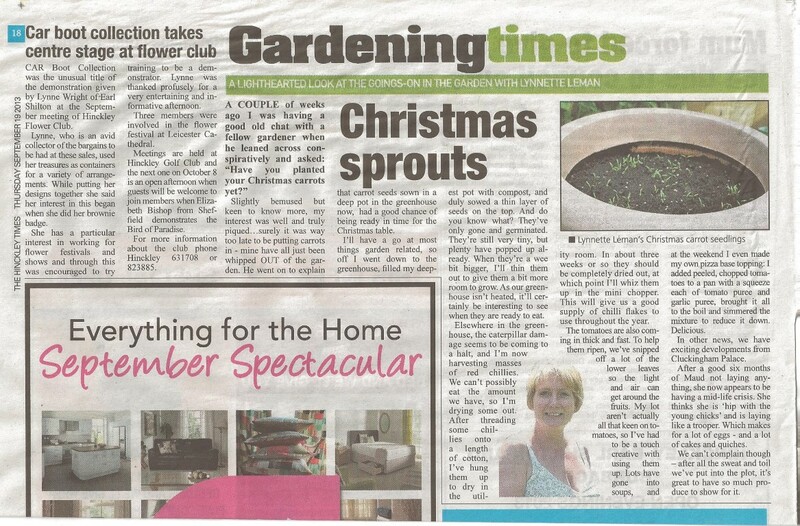 Looking around, I’ve also managed to amass 20 chilli and pepper plants and 10 aubergines. Together with the squash and courgette collection that will go out in a couple of weeks and the abundance of eggs on their way, I have a feeling it’s going to be a ratatouille and quiche-filled summer.